Movies. Cinema. Photoplays. Motion Pictures. Film. They all mean the same thing, but why? Funny thing. When Thomas Edison created the illusion of movement by putting together thousands of slightly different still images, inspired by Eadweard Muybridge (yes, that's his real name) and using technology perfected by George Eastman of Kodak fame, no one knew what to call it. So, you may have a favorite word or phrase that you use, but they're all correct. Admittedly, photoplay didn't really stick, but it explains why photo players have their somewhat odd name. Back a hundred years ago, no one would have given that a second thought. So. What, you may ask, is the first "talking picture," the first movie in which the sound is actually embedded in the film strip? Okay, most people don't ask it, because they think they know it. They claim it is the Al Jolson musical The Jazz Singer. But guess what: that's not it. The Jazz Singer was an innovative film, to be sure. Dialogue and sound was recorded for the film; however, it was originally a Vitaphone sound-on-disc system, which means the film would be playing simultaneous to a disc. If they were not played synchronously, then the sound wouldn't match the mouths. The movie was hugely popular after its release in 1927, so that, when the sound was eventually added to the film strip, people just assumed it was the first. 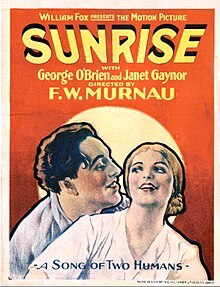 Actually, that honor goes to another film in 1927 called Sunrise: A Song of Two Humans, which earned the honor of receiving the Academy Award for Best Unique and Artistic Picture - the only year that award was ever handed out. Sunrise incorporated no dialogue, though, so the sound was only used for music and sound effects. But it paved the way for films as we enjoy them today.